I’m watching the rebroadcast of Game 6 on NBA TV right now (10:00 pm ET). I hope they win again. For the second time this series… a perimeter has gone down… and Doc Rivers has mentioned Tony Allen as a potential starter to replace him if he can’t go. A totally freaked out BostonSportz has the proof. If the Celtics get up by 15 or so… I could see bringing Tony Allen in for a few minutes to hound Kobe Bryant and make sure he doesn’t lead another big comeback. But I REALLY don’t want TA in the game when we need offense. Not only has he been disjointed in the offense for most of the year, he’s been sitting for so long… he’s probably way out of rhythm. Meanwhile, here’s a look at tonight’s refs… not that they’re expected to play a role or anything. Someone at ESPN is getting flogged for this right now. You’d think the people working the NBA Finals would know who’s who. Now Do You Remember…. ? …. why Tony Allen doesn’t play anymore? I’m just curious… after seeing him airball a 3… and then seconds later foul Joe Johnson while taking a 3… do you still think Doc is an idiot for not playing him in game 4? Just FYI… Tony Allen played his way out of those minutes at the end of the season… and he reminded us of that last night. You want to know why Joe Johnson didn’t break out and go completely nuts last night? Team defense. Ray Allen still checked him… but unlike game 4… Ray got help. Ray got help all season long… when we all knew he wasn’t a good 1-on-1 defender. Game 4 showed us what happens when you hang someone out to dry. Game 5 showed us what happens when the team helps on D.
Sorry TA… hope you do well on your next team. I don’t think we’ll be seeing much more of you on the court for the C’s. Milwaukee has the ball, down 99-96 with about 15 seconds left. Since the Bucks need a 3, what are the chances Michael Redd is taking the shot? I dunno, maybe 100%. Guess who’s covering Mr. Redd? That be Tony Allen. Redd gets the ball after coming off a screen, throws a simple upfake, and the trailing Allen falls for it and flies right by. Redd nails the open 3 and the game goes into OT. Tony, when is the lightbulb going to go off in that head of yours. The bench logged bigtime minutes in this one (Of the entire starting five – KG, PP, Ray, Rondo and Perk – no one played more than 20 minutes). Unfortunately they blew a 14-pt 4th quarter lead. The good news; the C’s held on and won it 107-104 in OT. I’ve been on record since before the season began… I think this is Tony Allen’s last year with the Celtics. Early in the last quarter Sunday, Tony Allen stole the ball from Miami’s Chris Quinn and had an open lane to the hoop. As he contemplated the possibilities, he lost the handle on the rock and left his layup on the front of the rim. And then there’s that picture… Tony Allen falling for the Chauncy Billups up-fake that led to the first home loss of the season (Pierce’s reaction in that still makes me laugh… click for full photo). Tony Allen is a restricted free agent… and I think the C’s will let him go. $1.8 million is too much for a guy who might or might not be there mentally on a daily basis. I’ll take it a step further: If Tony doesn’t toughen up mentally… he’ll playing pickup ball with Gerald Green instead of reporting to training camp somewhere. Elite athletes have killer instincts… and they let bad plays go so they can focus on the next play. Its how KG can give up a hoop to David West after going down on all fours… and the come back and dominate the rest of the game. I can’t think of a better word to describe the play of Rajon Rondo, Tony Allen and Leon Powe. These guys were absolute monsters tonight in the Celtics 111-100 win over the Clippers. Rondo (24 pts, 8 asst, 5 reb, 4 stls) and Allen (17 pts) relentlessly attacked the hoop. 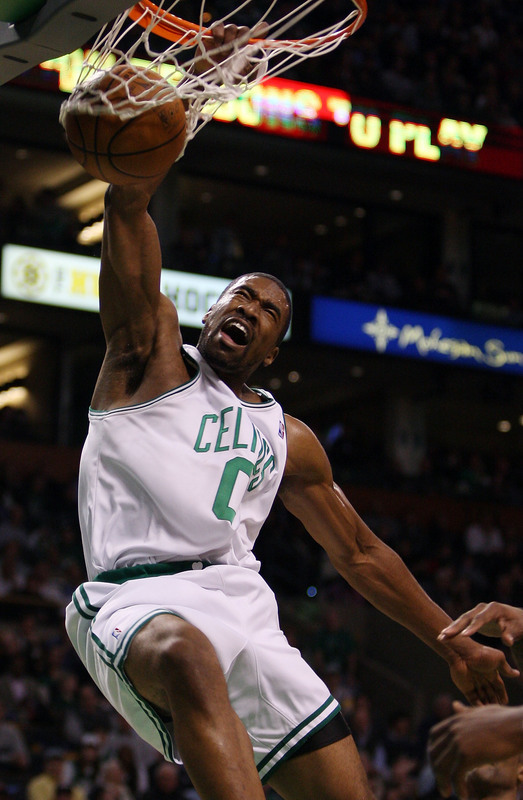 Powe (13 pts, 10 reb) was a pure beast on the boards. Sam Cassell, a guy I want the C’s to acquire, was ejected in the first half for literally punching Rondo in the face as he drove to the hoop. It was your classic cheapshot. The reason? The kid was abusing the old man on both ends of the court. Now for the bad news, Kevin Garnett says there is no timetable for his return. Garnett refused to put a timetable on his return. He said this injury is different than any he has had. So you won’t see KG Friday night in Minnesota. But what about Sunday’s game against the Spurs on national TV? Since December… The Boston Celtics are 17-4. The Portland Trailblazers are 18-3. I thought that even without Greg Oden, the Blazers would be a playoff team… but no one expected this. Brandon Roy is becoming a bigger star than expected. LaMarcus Aldridge is becoming a beast. What happens when they get Oden next year? “They can handle the ball OK,” Rivers said of House and Tony Allen. “But they don’t do a great job of running out stuff. (Monday) night we started (sets) on an average of 12 or 10 seconds (left on the shot clock). A web site called Stuff @ Night has included Tony Allen on its annual list of best bodies in Boston. Apparently he goes swimming with old ladies because they are always complementing his legs. How much do you work out? I work out every day when I don’t have a game. Do you watch what you eat, or does this body just come naturally? Sometimes I watch what I eat — I try not to eat too late — but for the most part I’m eating some of everything. What’s your favorite guilty-pleasure food? Cheeseburger with grilled onions. You have a great body now, but did you ever go through that “awkward” stage? No, not that I can remember. I always wanted to be like one of the action figures, one of the WWF wrestlers, so I did a lot of sit-ups, push-ups. If you could have anyone else’s body, whose would it be? Me. Favorite exercise? I love doing bench press and leg squats. Least favorite exercise? I hate doing oblique bridges. What’s the best body compliment you’ve ever received? When I go swimming, all the old women tell me I have nice legs. WHAT DO YOU CONSIDER YOUR BEST BODY PART? MY CALF MUSCLES. He also made the following lists: Most Likely to Fall for an Upfake, Most Likely to Commit a Turnover, and Most Likely to Blow-out His Knee on a Useless Dunk. This made for (a) the most heartbreaking moment of the season so far and (b) the goofiest picture of the season so far. Look at Paul’s face. Tony looks like he’s doing some sort of mid-air boogie. And Chauncey looks like he’s been shot in the back. I know he was trying to sell the foul… but he didn’t have to sell it that much. There will be no ‘upfake’ tonight. I think the C’s are primed for this. I think they’ve got something to prove to themselves. It’s obvious they looked past Houston and Memphis. They’re dying for this win.